Some very contented cats sitting on my favourite quilt. It was the first quilt that I actually quilted instead of tying. I love it - everything about it, the colours, the quilting and the design. It is a wonderful quilt. 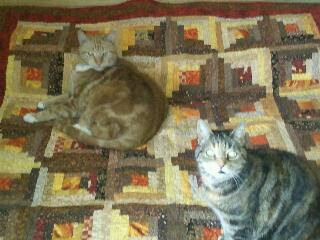 Many of my quilts also get the cat love. You know you have done good when the cats come to visit.